Across the globe, vaccinating broilers for coccidiosis has become a more safe, sensible and cost-effective means of controlling this costly disease in poultry "and it's easy to understand why. Not only does vaccination eliminate the need for residue-causing and resistance- prone in-feed coccidiostats, it provides life-long protection without the hassle or worry of withdrawal times. Vaccination has also proved to be an excellent way to minimize or even eliminate drugs from poultry diseasemanagement programs "a benefit that brings added value to meat produced by vaccinated birds. Perhaps the biggest benefit to coccidiosis vaccination still hasn't been realized, however. By eliminating the need for in-feed coccidiostats "products that must be fed for specific durations to be effective "vaccination also provides more flexibility in the feeding program and, as a result, enhances performance and profitability for poultry producers. The goal of every poultry feed program is to obtain optimal bird performance, meat quality and processability for the cheapest cost per pound (or kilogram) of produced meat. The primary objective of an anticoccidial program is to prevent both acute and subclinical coccidiosis while preserving the gut's integrity, reducing secondary disease and obtaining good growth and performance. Unfortunately, while it is convenient to administer coccidiostats through the feed, it is not always easy to meet both goals at the same time. This is because the rigid protocol for using the in-feed anticoccidial might prevent producers from making changes in their ration to optimize nutrition. An ideal coccidiosis-management program is therefore one that is free of side effects, allows optimum feed formulation for the type and weight of the birds, permits acceptable feed-mill management, and ensures the production of residue-free chicken meat. "� Finisher/withdrawal: Until the end of cycle with no anticoccidial. For most anticoccidial drugs, the dosage range is a compromise between effectiveness and safety, especially with ionophores. To avoid toxicity, the drugs sometimes have to be recommended at sub-optimal dose. In addition, anticoccidial drugs are not equally effective against all Eimeria species, and coccidia can develop resistance to all anticoccidials. For these reasons, nutritionists and veterinarians have to devise and implement complex shuttle and rotation programs to try and achieve optimal efficacy with minimal side effects. The design, implementation and monitoring of successful shuttle and rotation programs, however, has become quite complicated and fraught with obstacles and risks. For instance, flocks cannot be treated with nicarbazin during early autumn or spring because sudden heat waves can result in high mortality, even in young birds. While valuable to the industry, ionophores can also present some problems. In northern Ireland, for example, detectable residual levels of the coccidiostat lasalocid were found in table eggs. The contaminated eggs were traced back to a feed mill that also produced broiler feed. A problem that is relatively common and devastating in its consequences is the accidental feeding of rations containing coccidiostats to non-target animals. For example, turkeys fed salinomycin- containing feed will experience increased mortality. Broiler breeders fed nicarbazin can experience a drop in egg production and fertility. Last but not least, producers need to consider the extra time and money spent by the feed mill for flushing systems of coccidiostat residues, planning and mixing batches of medicated feed, and avoiding cross contamination of drug-free withdrawal rations. 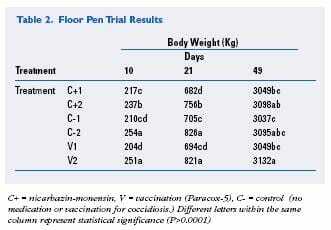 To obtain a better understanding of how in-feed coccidiostats can undermine a nutritional program, we performed a floor pen trial comparing three anticoccidial programs (drugs, vaccination with Paracox-5 and a negative control), and two different feeding programs. See Ttable 1 to better understand the design. While the trial was conducted in Spain, the results are applicable to virtually all major poultry markets. Diet 1, or the "conventional diet," is a standard in the Spanish market and is illustrated in Table 1. Withdrawal feed was fed for 7 days and the age of slaughter was 49 days, which is also common in the Spanish market for heavy birds. Diet 2 differs from the conventional diet in the starter phase; the pre-starter (0-10) is designed to have better digestibility and higher essential amino acid levels with "less aggressive" ingredients. The feed from 10 to 21 days had lower energy and protein levels than the standard starter, so we expected bird growth to be somewhat slower. Live weight results are presented in Table 2, page 12. There were no differences in body weights at the end of the fattening period (49 days) among medicated and vaccinated birds. Diet 2 gave significantly higher weight than Diet 1. It is remarkable that control birds had similar weight under any of the anticoccidial treatments, which reinforces the idea that no coccidiosis challenge occurred at the experimental farm, as expected. Despite that, the baseline performance of vaccinated birds did not differ from birds treated with anticoccidials. It was, in fact, numerically better if not significantly better. There appears to be an interaction between anticoccidial treatment and diet. With Diet 2, control birds are in line with vaccinated birds (no coccidial challenge). Vaccinated birds performed much better than birds receiving an anticoccidial under Diet 2 (enriched starter) but do worse with Diet 1 (standard). This is consistent with the speculation that a specially tailored diet can be a big advantage when birds are vaccinated for coccidiosis. In practice, assuming that untreated birds are not feasible in field conditions, the larger growth rate is obtained with vaccinated birds and Diet 2, where there is no growth depressor effect from nicarbazin and there is a good gut function due to the diet. The trend is maintained despite the fact that Diet 2 was lower in energy (6%) and protein (3%) than the conventional diet. This reinforces the idea that a starter is not really needed through 21 days. There were no significant differences seen in the feed conversion ratio, final body weight, daily weight gain or mortality at 49 days among anticoccidial treatments. Based on the literature and the experience of several nutritional consultants, it is fair to say that coccidiosis vaccination can do more than just protect birds from coccidiosis. The aim is to fit the typical curve of nutritional requirements under nutritional and economic criteria, without worrying about controlling coccidiosis via infeed treatment. Coccidiosis vaccination is the newest tool available for coccidiosis control. Since it provides solid, life-lasting protection, it helps eliminate resistance and the need for complicated in-feed anticoccidial programs. It also eliminates the risks associated with anticoccidial drugs. Coccidiosis vaccination allows feed mills to optimize their diets and provides for more flexible feeding programs. Moreover, birds can be removed at any time from the house, whether an antibiotic growth promotant has been used or not, since there is no worry about chemical residues. Birds can be sent at any time to the slaughterhouse after fasting just a few hours, which fosters more flexible planning and farm management.